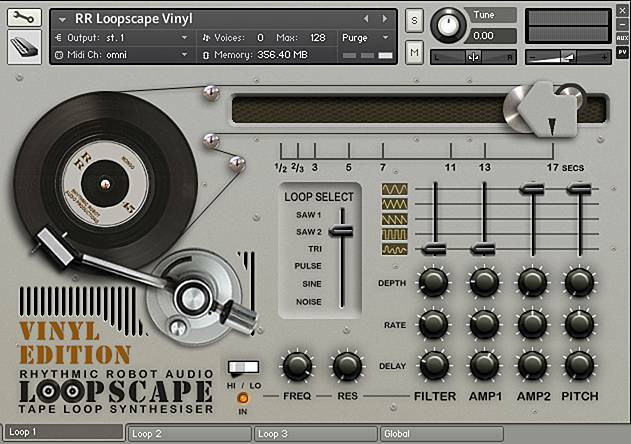 Buying Loopscape Vinyl entitles you to get its sister product, Loopscape, for half price! See our Hot Deals page to grab this offer. Loopscape Vinyl starts with a host of entirely new recordings of classic synth waves: two ballsy sawtooths (one with a sub-oscillator) from our modular system, a smooth triangle from the Roland SH7, a gritty pulse wave from a Yamaha CS30, and a nice mellow sine. All of these were recorded in pristine quality, and then sent off to be pressed to a series of custom vinyl dub plates. Once we had our lovely new vinyl LPs back in the lab, we set about sampling the waves straight off the vinyl. And that’s where “pristine quality” and “high fidelity” went right out the window. The whole fun of the original Loopscape was that it wasn’t clean, clear and precise – it was wonky, creaky and wobbly. Loopscape Vinyl carries on that proud tradition. Our turntable wasn’t reference-grade. In fact, it was a Dansette from the early 1960s. Our records weren’t wiped carefully with that little furry brush and put back in their sleeves after use, held only by the edges. In fact, Mongo may have dropped them down the stairs, and I may have “accidentally” spilt a beaker of Telecaster bridge screws and machine heads on some of them, leaving some unpleasant dings and scratches. There may have been dust, and grit, and some judicious application of a hair-drier. All in all, these aren’t going to win any awards for audio precision. What we were going for was the kind of sound you might get from an Optigan… if it had been reinvented as a synthesiser… built in the 50s… and then not-very-well maintained for half a century. In short, a bit of a relic. 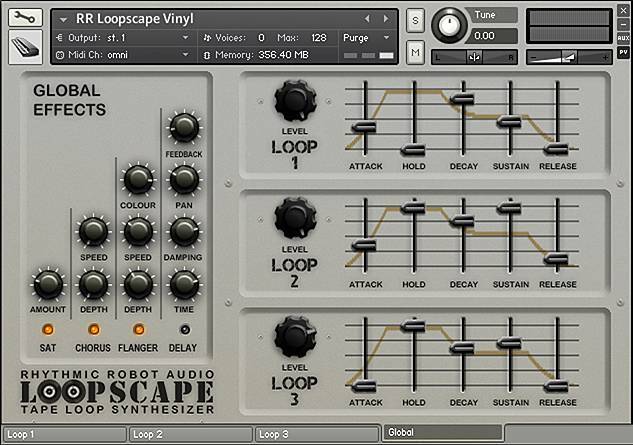 The result is a collection of looping audio waves with some serious attitude and character. They’re gritty; they snap, crackle and pop more than a bowl of breakfast cereal; the loop points aren’t disguised so much as celebrated. With three different-length loops of between half a second and seventeen seconds up and running, plus a host of LFOs and other periodic fluctuations at your disposal, you can craft endlessly-changing, never-to-be-repeated soundscapes that are stamped through with the subliminal nostalgia of vinyl. There’s just something about the sound of a real record on a real turntable with real scratches and crackles that brings a synth wave alive; and here, that vinyl DNA is built right into the synth itself. 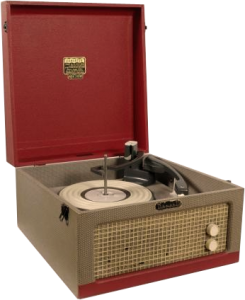 We even created the Noise wave by mixing endstop crackle with the sound of the Dansette’s stylus being scraped along the record edge – so it’s rather more unusual than standard white noise! Loopscape Vinyl is not a precision instrument. Don’t expect cutting, clinical sounds from it: in fact, don’t expect two consecutive notes to sound the same, cos they won’t. What it is is a great way to get warmth, instability, movement and “incommensurability” into your tracks: it excels at pads, washes and background drifts, odd synthscapes, weird sound-design and generally all manner of vintage-style strangeness, all with that unmistakeable stylus-in-a-groove character. If you’ve been looking for the antidote to the modern digital “in the box” sound, you just found it. A deep instrument with a lot of movement. Love the crackling. Eno. Minimalist. Repeat loop. Eno. Minimalist. Repeat loop. Eno. Minimalist. Repeat loop. Cut against the grain of the groove. Ah, yes. This is great. Have been using this for a few months now. Not sure which I prefer – this or the tapes, but I love the wonky charm that this brings, and as always it looks great too! You can chew regular gum, or you can get that stuff from Willy Wonka that’ll last forever, and turn you into a blueberry. What’s my point? You could buy some crappy generic pad, or you could get this thing. Like the original Loopscape only a bit different. But the same high quality wonky, evolving pads and textures. If with Platter you are able to recreate in a excellent way the atmosphere of old vinyl records, with Loopscape Vinyl you are able to produce always different and evolving texture, often with an abstract feel. This is a wonderful tool for trip hop and gets you right into that lo-fi b-movie range that is oh so sweet. Amazing. Beautiful overlapping soundscapes and a really great alternative to my usual go-to analog synths. fantastic, crunchy and quirky addition to my plugins!! Mongo’s twelve inch special. Epic. Instruments, washes, and funny noises you can’t make words for. Fills gaps you didn’t know you had. A little bird tells me there’s a 78 version in the cupboard somewhere..
It’s a great way to flavor my tracks. I gives my music a natural feel with this fantastic vinyl emulator! Loopscape Vinyl is a fantastic addition to my palette of sounds. It’s a great way to add a bit of dirt, noise, and unpredictability to an overly clean track. It’s particularly well-suited to sound design and tracks with long droney bits. Spooky, ethereal, and lovely!